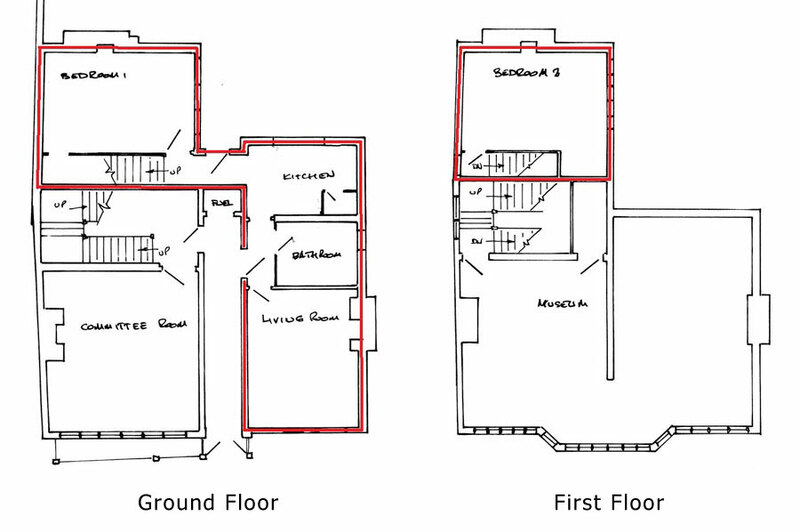 The suggestion is that the rear staircase is related to the building’s past as two households, and that there were front and rear properties. This isn’t borne out by the early survey drawings, which show just the one staircase. The 1958 alterations were to create a caretaker’s flat for the Watson Hall and a Museum. The drawings show how this was done. What is now the office was the front door to the flat, which had no other communication with the Museum. The staircase was formed from part of the rear rooms, to give access to the bedroom on the first floor. A few years later, the flat was given up and the space incorporated into the Museum. Two openings were made, but the staircase was left in place, to cause confusion and speculation.